HO-HO-HOLY COW, The Harmony Boys are back for a Christmas reunion show and they’re better than ever! 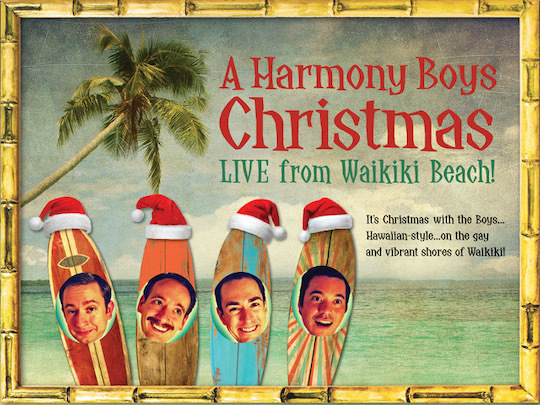 The Harmony Boys was one of the best shows at the 2017 Hollywood Fringe Festival and they’ve returned this year for a brand-new holiday show – live from the ballroom of the Grand Kahulahani Resort & Sacred Indigenous Burial Ground! The Jaime Robledo production is a throwback to classic 1960’s cheesy “Americana” Christmas variety specials featuring singing siblings – you know: the Smothers Brothers, the Williams Brothers, etc. It’s 1963 and the quartet known world-wide as “The Harmony Boys” (Al Rahn, Gabriel Oliva, Mike Hoy, and Aaron Matijasic, who also penned the script) are hosting a live broadcast full of Christmas songs, surprises, and more than a few holiday miracles. Joined by their “Harmonettes” (Jenna Townsend, Heather Roberts, and Whitney Vigil) and leader Billy Harmon’s family (Amanda Hootman, Camdyn Wren, and Danny Domroy), the Boys struggle to bring you an old-fashioned Christmas, even as the 1960’s civil rights era threatens their perfect white-male-dominated world. The show has something for everybody – a live band, incredible renditions of traditional and non-traditional Christmas songs, and scathing commentary on current events and the state of America. At their core, both Harmony Boys shows have been about holding the mirror up to “traditional values” and brutally dissecting them – which, of course, is why Matijasic brilliantly set both shows during the most “traditional values” holiday of them all. The show fluctuates beautifully between high- and some emotionally-affecting low-comedy (one husband-and-wife duet fight gets almost “too real”) tackling everything from race relations, sexism, and Nationalism to male fragility, homophobia, and commercial branding. Jaime Robledo directs with his typically genius hand, the set by DeAnne Millais is truly stunning and worth the price of admission alone, the live band is tight and on point, and the brilliant “let’s go live” projections by Brian Wallis bring an extra authenticity (and one of the funniest moments) to the show. The performers are across-the-board wonderful, including Christopher Lee Lemay as the Boys’ agent Morty and a hysterical Everjohn Feliciano as “local islander stagehand” Pupui. A Harmony Boys Christmas is a theatrical fruitcake of comedy and the perfect holiday treat for the woke crowd. See it before the season is over!